The media need to separate anger over Trump's unfounded wiretap tweets from legitimate questions about Obama administration surveillance. Trump said the surveillance was inappropriate and Dickerson asked him what that meant. They went back and forth a bit, with Dickerson asking if Trump stood by his claims regarding Obama being “sick and bad” — a reference to his March tweets claiming Trump Tower had been wiretapped. Now, by the time Trump tweeted this in early March, it had been reported for months that Trump Tower had been wiretapped in October, but the reporting was mostly done by conspiracy theorist Louise Mensch, so it was not taken very seriously. She had also reported that an initial request for a FISA warrant against Trump and associates had been turned down. The media responded to these tweets from the president by, reasonably, asking him for proof of President Obama literally wiretapping Trump Tower. No evidence of wiretaps being laid down in Trump Tower has been provided by the president or anyone else. Congressional committees investigating both Russian meddling and illegal leaks by U.S. officials have said they have no evidence of literal wiretaps, much less ones placed personally by President Obama. And intelligence agency chiefs have said they have no evidence of literal wiretaps of Trump Tower. Because President Trump made incendiary and unsubstantiated claims about wiretapping that he’s been unable to prove, the media have interpreted this, for some reason, as an excuse to pretend that there is nothing at all whatsoever to claims that the Obama administration spied on members of the Trump campaign and the incoming administration. That question — of surveillance of Trump and associates by intelligence agencies — is a separate question from whether President Obama snuck into Trump Tower one night on hands and knees to personally lay down some taps on Trump’s phone lines. When I’ve raised this point with journalists, most if not all of them have been unable to separate these issues. Some have accused me of wanting to talk about Obama administration surveillance against Trump in order to defend Trump’s erroneous tweets. One claimed I was “twisting theories to try to make a Trump falsehood true.” Wrong. I’ve repeatedly acknowledged that Trump has provided no evidence for his surveillance tweets. With full credit to the literal-serious divide on the president’s rhetoric, he should be more precise with his language if he wanted to talk about general surveillance instead of the comparatively specific claims he made in his tweets. In any case, I’m beginning to wonder if journalists’ refusal to discuss, much less really dig into, the information collection and dissemination on Trump associates is itself a desire to not give any credence to Trump’s more outlandish claims in his tweets. It reminds me a bit of an ex-boyfriend who accused me of cheating on him. I wasn’t, but he was not faithful. Journalists need to know that they can and should separate Trump’s irresponsible tweets from the general questions about Obama officials and others in intelligence agencies surveilling a political campaign and presidential transition. Last week, ABC News and the Washington Post put out a poll that “alarmed” CNN’s Jake Tapper. He focused on it for an end-of-show lecture on fake news. 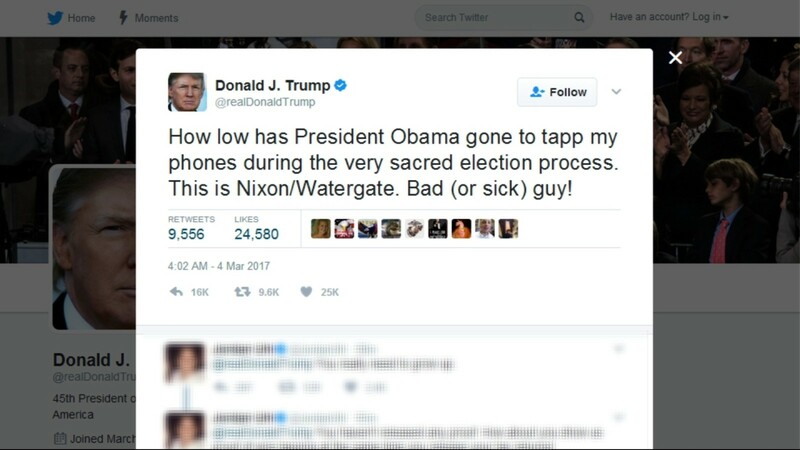 “A shockingly high percentage of Americans believe President Obama intentionally spied on Donald Trump and members of his campaign,” Tapper reported. So that would have seemingly been that, except that the president and his team kept pushing ways to try to make this evidence-free claim somewhere sort of possibly in the neighborhood of almost not entirely false. Now they failed, but they muddied the waters quite a bit. And now here are the shocking numbers from today. 32 percent of the public thinks President Obama intentionally spied on Donald Trump and members of his campaign and 52 percent of Republicans believe this charge. A charge that there is literally no evidence to support. It is the definition of fake news. There are several problems with this complaint. The poll question was fairly broad, if awkwardly worded. The wording is slightly different than characterized above. It was: “Do you think the Obama administration intentionally spied on Trump and members of his campaign during the 2016 election campaign, or not?” What is “intentional” spying referring to, exactly? And would respondents have an agreement about what that means? Who is considered a part of the Obama administration, exactly? Is the timing of the question meant to exclude the leaks that occurred after Trump won the election? After the Electoral College voted? Until inauguration? The FBI last year used a dossier of allegations of Russian ties to Donald Trump’s campaign as part of the justification to win approval to secretly monitor a Trump associate, according to US officials briefed on the investigation. That story, which probably arose out of a desire to cushion the blow from questions Sen. Chuck Grassley began asking about the FBI’s use of a shady and discredited dossier, explained that the FBI was spying on a member of the Trump campaign named Carter Page. I repeat, the FBI had secured a FISA warrant to spy on a member of the Trump campaign, according to CNN. I know that the media have serious credibility problems, but you can’t get mad at people for believing what you report. The FBI is in the executive branch’s Justice Department, although its intelligence activities are overseen by the director of national intelligence. Obama’s DNI was James Clapper, who has repeatedly denied the frequent speculation of his involvement with leaks against Trump. 2) This information, which was politically valuable, had little to no reason to be shared in intelligence reports to Obama officials, but was disseminated widely. 4) The unmasking had nothing to do with Russia. It was later reported that Susan Rice, President Obama’s national security advisor, was one of the Obama officials who had requested the unmasking. While some anonymous sources, some of whom have been included in news reports despite not having seen the documents in question, claim there are non-nefarious reasons for such unmasking and dissemination of politically sensitive information on political opponents, it doesn’t change the claim that unmasking and dissemination of politically valuable information with no intelligence value was committed by the Obama administration. Would it be reasonable to answer a question on the Obama administration spying on Trump and associates in the affirmative with the knowledge of this claim of unmasking and dissemination of politically sensitive information with little to no intelligence value? Our media have been little other than anonymous leak receptacles for months. Whether it was leaks about Trump campaign associates supposedly having nefarious ties to Russia, the criminal leak of Mike Flynn’s name, the criminal leak of information about a FISA warrant being secured against Carter Page, the orchestrated release of information about the presentation of a shoddy dossier to President-elect Trump and President Obama, or any of the dozens of leaks used to orchestrate a Russia scare narrative, it doesn’t take a tremendous amount of smarts to figure out that when transcripts or snippets of information are shipped to reporters, the information must first be collected via surveillance and other means. Many of these leaks were sourced to senior intelligence officials during the last days of the Obama administration, after which many of these leaks were sourced to former senior intelligence officials. There’s also the issue that the same ABC News/Washington Post poll mentioned above showed that 72 percent of Clinton voters think not only that Russia tried to influence the election, but that the Trump campaign intentionally tried to assist such an effort. A few months ago, the last time I saw the question asked, a majority of voters believed that Russians had actually hacked the vote tallies in the election. Needless to say, there is as much evidence to support these claims as there is to support Trump’s wiretap tweets, which is to say none at all. Is it more alarming that 52 percent of Republicans believe the Obama administration spied on the Trump campaign or that 72 percent of Clinton voters think that the Trump campaign coordinated with Russia in their hacking and release of Democratic emails? Is it embarrassing to mention the Clinton voter figure on account of how much media outlets have perpetuated this unfounded story? We learned in the campaign that Donald Trump can be cavalier about facts and truth. We learned in his first 100 days that that’s not going to change. Indeed, that some in the government and some of his friends and conservative media will even work to tried and make his falsehoods seem true. Again, while all of that may be true, it’s also true that we have a media establishment that works to downplay, denigrate, and dismiss legitimate stories if they fear that those stories in any way help a president they oppose. That reflexive refusal to fairly cover — or just cover, period — stories that might help the president is not how readers or viewers are served. Journalists should go where the stories lead, even if they threaten to harm their best Obama intelligence sources and leakers from the last few months or help a president they worked very hard to defeat. If they need to mention their frustration with his tweets 18 times before they cover FISA warrants, unmasking, or other intelligence actions, that’s fine. But they can’t let that frustration keep them from covering a big story in the public interest.